Apple seems set to shift over 50 million iPhones worldwide by September 2011, said Bernstein Research analyst, Tony Sacconaghi, last night. That’s up from an estimated 20 million sales in 2009, the analyst explained – and it is not rocket science, the analyst reckons Apple will achieve these targets simply by retaining its current share of the smartphone market and by making the device available through more carriers. The analyst expects the smartphone sector to jump 27 per cent a year for the next two years, adding 10.3 million iPhone sales to Apple’s balance sheet. He also believes wider distribution through more carriers in the US, Europe and Asia could generate an additional 18.5 million sales. And finalising a deal with a Chinese carrier could pop another 2.9 million iPhones into punter’s hands. There’s a case for an iPhone nano, the analyst believes: “We believe that more aggressively targeting the prepaid market with lower price models or offering an iPhone that does not require a data plan – but still has WiFi connectivity – could significantly expand Apple’s addressable market,” he wrote. With touch screen prices now in decline (says Digitimes this morning), Apple also has a chance to continue to prune the price of the iPhone 3G. 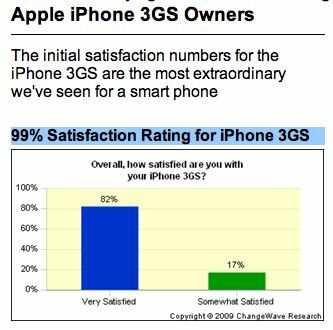 Meanwhile, here’s an amusing graph from Changewave Research which explains just why the iPhone is gathering ever more consumers to its cause – they’re deeply satisfied with the device.